ACEE is looking to fill two positions - Energy Efficiency Program Manager and an Educator. These are full-time, salaried positions. Deadline to apply is April 12th. Learn more. 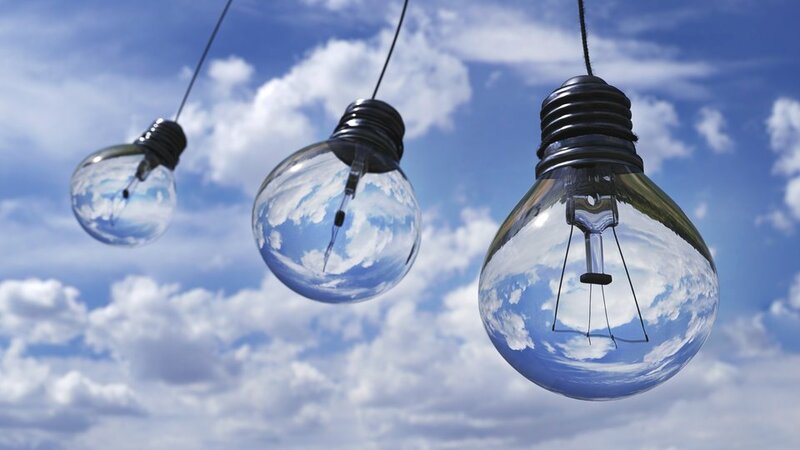 ACEE will advance education about energy conservation, efficiency, and renewables! We're thrilled to announce significant new funding that allows us to give students valuable new knowledge and skiils, prepare them for future jobs - and give them hope as they take climate action. Click here to find out how we'll do this! Werklund School of Education at the University of Calgary is hosting a FREE evening event Wednesday April 25th. This is a public presentation of research findings, a Canadian curriculum review, resource website launch (https://indigenousenved.ca/), and insights from a panel of educators representing a variety of school, community, and post-secondary settings. Dinner is provided. Change for Climate: Festival of Youth Voices - students were the stars! The City of Edmonton created the Change for Climate Community Series leading up to the Cities and Climate Change Science conference in Edmonton. ACEE coordinated the Festival of Youth Voices with partners NAIT and the Centre for Global Education. 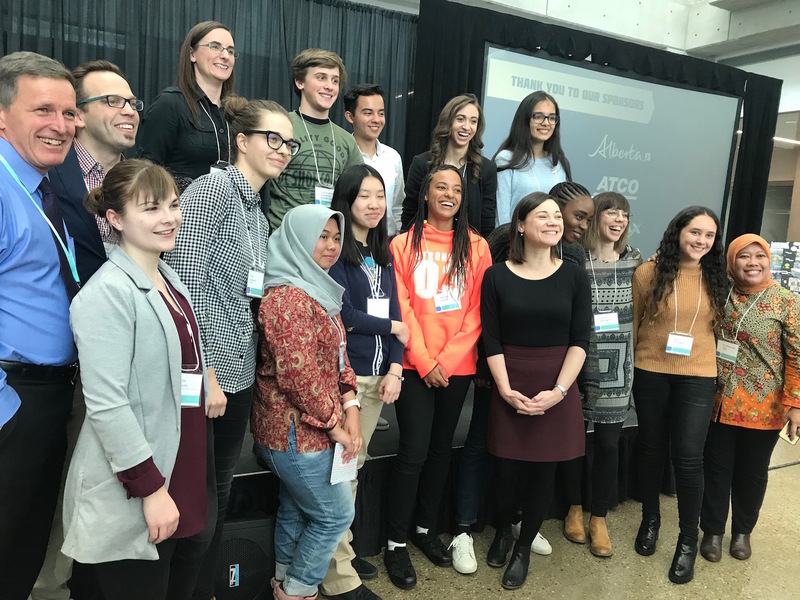 This was an exciting day with students from Alberta and around the world sharing their climate change stories and recommendations with decision-makers and leaders. We watched inspiring videos from young film makers and students heard from an expert panel. On March 6th, Edmonton Public School Board Trustees passed the motion to present their Solar Energy Strategy to the province requesting funds for implementation of this plan. The feasibility study showed that installing roof-top solar arrays on 25% of their schools would generate over 40% of their electricity needs and reduce carbon emissions by 40%. The multi-year strategy addresses upgrades to roof structures and installing solar arrays on 52 schools in the district. Congratulations to EPSB on this instrumental first-step in implementing a district-wide solar strategy. Use the new website from Pembina! You can invite students to explore Alberta's new energy projects (and add your own education project, if you’d like! ), connect students to high interest stories from places like this Alberta school, and explore some great resources. Canada Green Building Council and the Canada Coalition for Green Schools are looking for schools that are weaving sustainability education into their curriculum and bringing programs and activities to students that encourage awareness about the environment. This contest is open to all grades. 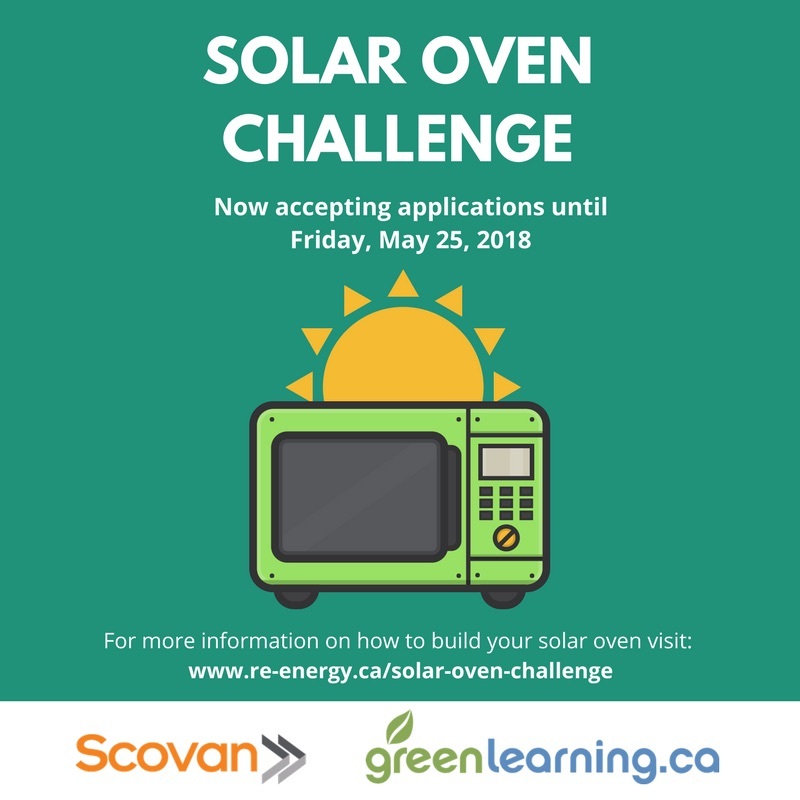 GreenLearning Canada hosts this delectable renewable energy challenge for Canadian classes every year which challenges participants to build, test, and bake with solar ovens. Students use the solar oven construction plan provided by re-energy.ca, or they design their own plans. Teachers register their classes—which in the past have ranged from grade 3 through to grade 12, and from science classes to environmental clubs—to be eligible to win prizes and certificates. Conference - Beyond the Classroom - Ways of Knowing June 14-16 in Calgary. This conference focuses on programs and learning that happens outside classrooms. Learn more. Event - Green Calgary's Energy Revolution Fair, a free one day pop-up event in Calgary. 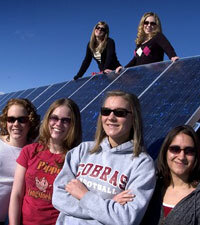 Do you have students at your school who are ready to be leaders in renewable energy? We offer student teams the chance to showcase their renewable energy projects for a chance to win cash prizes for your school! Learn more. Webinar - Canadian Wildlife Federation is hosting a webinar May 3rd - Teachers and Nature. Sign up and learn more. Program - Outdoors In - offers Nature Connection programs for schools and preschools as well as spring and summer camps in the Calgary area. Learn more. Program - The Planet Protector Academy: Keep Cool is a digital-led teaching resource on climate change for Grades 3-6. Students explore climate change, energy & transportation issues through fun, arts-based activities in teams before going home on superhero missions to change their families' habits. Fully funded for teachers in Calgary and Edmonton (use the links to sign up!). Program - Andrew Stiles is the Calgary Birdman! He is passionate about building bird houses with students and can come to your Calgary area school. Learn more. Resource - An educational resource for critical indigenous environmental topics created at the Werklund School of Education at the University of Calgary. Learn more.